A court in the Indian capital, Delhi, has directed police to probe claims by two prisoners that they were pressured to kill Commonwealth Games officials held in the same prison. TS Darbari, Sanjay Mohindroo and M Jayachandran are being held for alleged financial malpractice at the Games. Two prisoners complained that prison officials had given them a gun and a knife to kill two of the officials. Prison officials have dismissed the allegations as "baseless". The two prisoners are being held in the capital's main Tihar prison facing murder charges. The court has asked police to investigate and submit a report. Senior prisons official Neeraj Kumar rejected the claim, telling a local news channel: "The two prisoners wanted to browbeat jail authorities [by making the allegations] because they wanted to be shifted out of their [high security] cell." Mr Kumar said a search of the prisoners and their cell had found nothing. Reports say the Commonwealth Games officials are also being held in the high security cell. TS Darbari and Sanjay Mohindroo were arrested on charges of irregularities over the awarding of Games contracts linked to the Queen's Baton Relay in London last year. Treasurer M Jayachandran was arrested in connection with an alleged scam to award contracts at inflated prices. In October, Prime Minister Manmohan Singh ordered an investigation into alleged corruption at the Games. 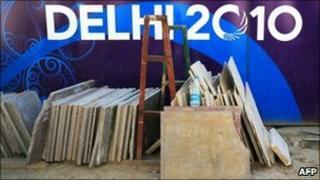 The budget for the event - held in Delhi - ballooned to an estimated $6bn (£3.87bn). The Central Vigilance Commission received complaints that up to $1.8bn of Games money had been misappropriated. The commission's report found poor quality materials were used and there were huge cost overruns on construction projects.